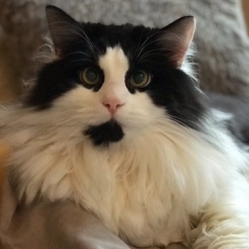 I’m a handsome longhaired boy, totally blind but am super-affectionate, love cuddles, & I’ve adapted well despite living in a dark world. My favourite toy is rolled up paper balls, I can hear them rustle and chase them even though I can't see. I need a quiet home with gentle settled humans, who would be in the house lots who would not move furniture around. I don't want young adult humans whose lives, relationships and homes are bound to change as I wouldn't cope with change well, like the birth of a child, so no small children either now or in the future nor other pets as it's too stressful as I can't see them approaching. Of course I must be an indoor cat. I’m only around 2 years young. Call Maria 07719605383 to chat about adoption.